Strategy & Tactics 215: Recent 2003 issue of the long lasting military history magazine with a complete wargame in each issue. 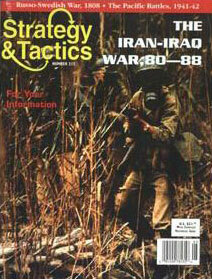 This issue has a game covering the Iran-Iraq war between 1980-1988. The game is unpunched and in excellent condition and even has a Sadam piece. The magazine is in used condition and has articles on the historical background of the game as well as the Russo-Swedish War in 1808 and the Pacific Battles of 1941-42.